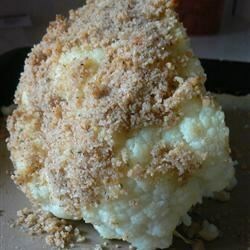 "If you thought you didn't like cauliflower, try this! It's an awesome treat for a festive table. Beautiful presentation and something out of the ordinary." Clean cauliflower, and trim off leaves and any brown spots. Place the whole head of cauliflower into a steamer basket, place the basket in a large pot, and add one inch of water. Cover, and bring to a boil over medium heat. Cook for about 20 minutes or until tender. Preheat the oven to 375 degrees F (190 degrees C). In a medium bowl, mix together the bread crumbs, Parmesan cheese, melted margarine. Season with garlic powder, salt, red pepper flakes, and oregano, and mix well. Place the head of cauliflower into a baking dish, and coat with the breadcrumb mixture. Bake for about 10 to 15 minutes in the preheated oven, or until golden brown. The secret to having cauliflower with flavor is steaming/simmering it in chicken broth. Then put it in the oven with the breadcrumb mixture. Yummmmmmmy!